A keyswitch-isolatable monitoring point c/w a RESET button for cancelling calls. 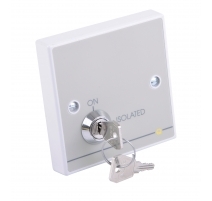 Can be configured to generate a Standard or Emergency call when a fire exit or drug cupboard is opened (via magnetic contacts) or a telephone or door bell rings. Can be used to monitor any device with a normally open or normally closed switch - ideal for interfacing PIRs, strip switches, flow switches and other devices to Quantec. When isolated, the QT604's reassurance LED will illuminate Green and the monitored door or device may be opened and closed without signalling a call on the system. QT604M secure magnetic reset version also available. Indicators Red/Green Reassurance LED (lit green when device is isolated). Controls Isolation keyswitch (switches monitoring off when ISOLATED); Reset button (cancels calls made from the monitoring point and from devices wired on the same Zone). Note that a QT604M magnetic reset version is also available. Expansion connections R (Red) and G (Green) connections allow the connection of an optional slave overdoor light. Alternatively G (Green) and SW (Switch) can be used for an optional Call Alert Unit allowing telephone monitoring (see instructions). Product dimensions (mm) 87 W x 87 H x 29 D mm. Mounts on a UK 25mm single gang back box.